INTERVIEW OF GEERT WILDERS BY THE BBC……. – The Tundra Tabloids……. The Tundra Tabloids loathes the main stream media. For the most part, they’re the most anti-intellectual, incredibly lazy, stupid, ideologically driven group of moronic and dishonest “professionals” the world has ever seen. The BBC, who I believe conducted the following interview with Geert Wilders, represents this class of so called journalists, as well as the Daily Mail. 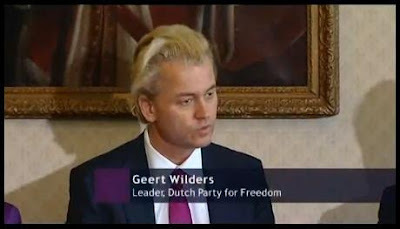 To label a conservative democrat like, Geert Wilders, “far-right”, is to reach a depth of stupidity and laziness, that unfortunately has come to typify present day journalism. It’s why the blogosphere is so popular, as people use the latter to get the corrected (fisked) version of the biased (but won’t admit it) lame stream media’s news. For an example, because of the lazy and intellectually dishonest media, the public remains entirely ignorant of the fact that Fascism and Nazism are entirely a Leftist ideology, and not “Right-wing” as they keep on implying. It’s one of the reasons why the Left has been able to build an image of itself as being on “the side of the people”, while their economic and social policies mirror that of the National Socialists in every respect. They’re the ones (the Left) who are always talking about race, and busy pitting one group of people against the other. Wilders is the one who wants everyone in Dutch society, regardless of race, color or creed to follow the same rules of society, but its the Left who consistantly allows certain members of that society to flaunt those rules in order to create a steady voting block for itself. Far-right Dutch MP Geert Wilders provoked angry scenes outside Parliament yesterday after claiming that Islamism and democracy are ‘incompatible’. Mr Wilders was visiting London to show his anti-Islamic film Fitna at the House of Lords. About 200 members of the English Defence League marching in support had to be kept apart from (TT: fascist enablers themselves) anti-fascist demonstrators chanting ‘Nazi scum, off our streets’ by lines of police. About 50 arrests were made, mostly those taking part in the protest organised by Unite Against Fascism, a police spokesman said. Mr Wilder’s visit to Britain came after his far-right party scored major gains in Dutch elections. The 46-year-old Freedom Party leader is now on course to win the most Parliamentary seats in the country’s June 9 election. If so, it would be impossible for the current coalition government to rule without forging a strong coalition with him. He could even land the title of prime minister, after a new poll showed that he was fifth on the list of Dutch voters’ preferred candidates. Previous Post Previous Post GEERT SHOWS FITNA WHILE SUPPORTERS MARCH IN FAVOR IN FRONT OF PARLIAMENT……. Next Post Next Post PAMELA GELLER STUFFS MAX BLUMENTHAL’S HEAD WHERE THE SUN DOESN’T SHINE…….